Rumor has it luck and fortune follow crickets wherever they go, which may explain why the Chinese once carried these insects in small bamboo cages. 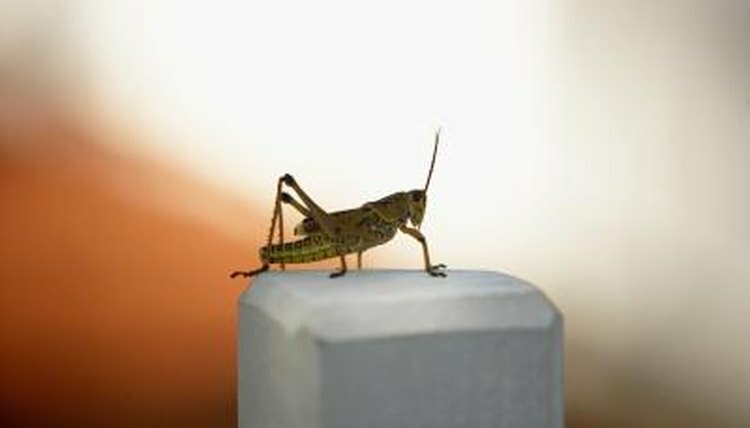 Occasionally crickets can be pests, damaging crops or seeds, but generally, people happily co-exist with them, even appreciating their unique songs. Chances are, if you come across a cricket in your house, it's a field cricket -- one of the most common type of crickets in the U.S. There are several types of field crickets in the U.S., ranging from 1/4 to 3/4 inch long. A cricket has a round head, topped with long, thin antennae, which add up to an inch to his body length. He has wings along the side of his body, which is flat on the top and comes in a variety of colors, including black, brown, red and green. Despite the presence of wings, the cricket moves by jumping. This insect is known for his chirping noises. The male cricket rubs his front wings together to make his chirping sound. The female's wings aren't built the same way, so she has no chirp. Instead, she listens to the male's song with her "ears," which are smooth, round structures on her lower legs. Males listen the same way. Crickets can be found throughout the world, and the U.S. has more than 100 species of crickets. Home can be any number of places, including soil and living or dead plants; a cricket needs plant material to eat and is often found in humid areas with plenty of plants to choose from. Depending on the type of cricket, he may be found in marshes and swamps, forests, deserts, mountains, scrub forests or rainforests. This fellow eats more than plants; he's often a welcome addition to many gardens because he enjoys dining on other insects, including aphids and ants. Fruit, seeds and nectar also comprise his diet. Unfortunately for him, he's also part of the food chain for a variety of predators, including birds, rodents and frogs. The cricket hides to avoid predators and will jump very fast if he's discovered, in hopes of a fast getaway. Crickets mate from late spring into early fall. The female lays her eggs one at a time in soil or in small groups in plant matter. Ultimately, she may lay dozens or up to a couple of hundred eggs. When a young cricket hatches, he looks like an adult, but as a male, he has to grow into his wings. He has a short existence, usually living about a year, rarely surviving more than one winter.